We have been selling cheese wedding cakes from our shop in Berkshire for nearly a decade, and have seen their popularity grow and grow. Many people are now choosing cheese wedding cakes as an alternative to a traditional wedding cake or cheese board. They are particularly popular centre pieces for an evening buffet and can even give the bride and groom a second opportunity to cut their "cake", in front of guests who may not have attended the wedding breakfast. This trend is now well established and makes perfect sense: cheese is ideally suited to accompany wine at any celebration. A "cheese wedding cake" or "cheese tower" is a selection of cylindrical cheeses, presented in such a way that it resembles a traditional wedding cake. At Tastes, we go to great lengths to select cheeses, that meet a number of exacting requirements. They need to be wonderful traditional or artisan cheeses, which the happy couple and their guests will enjoy the taste of. The cheese tower also needs to look good, in keeping with the style/theme of the event, and consist of cheeses of different and complementary sizes. There needs to be enough cheese for the size of the party and a good balance of tastes and textures. 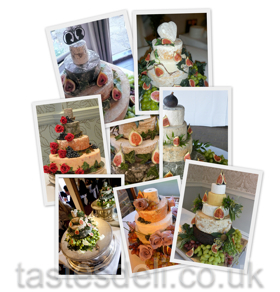 At Tastes, we can create a cheese wedding cake especially for you, taking into account your tastes, budget and guest list, or you can choose from the selection shown below. The prices shown are for the cheeses only. Prices start from around £145 and average around £2-£3 per person. Our vital statistics report (pdf) shows the size and weight of all our cheese towers to help you choose the right one for you. We are always happy to come up with bespoke designs! Some examples of our cheese towers are available in our facebook gallery and our pinterest board. One of our creations appeared in the September 2012 edition of You and Your Wedding magazine, you can see a photograph of the page or read the full Reader's Wedding article (as a pdf). As we do not hold full rounds of all our cheeses in stock all of the time, it may take a few weeks to dispatch your order. We are usually able to fulfil cheese wedding cake orders within two weeks, but please do contact us as soon as possible to ensure we are able to obtain all the cheeses in time for your big day. If you would like us to design a cake especially for you, please allow six weeks. To discuss a cheese wedding cake for your own event please get in touch. We also sell traditional sweets and sugared almonds, perfect for favours or to create your own pick and mix sweetie bar. Most sweets are around 80p per 100g, and discounts are available for large quantities. If you are planning a wedding, Eton is the ideal place to shop. In a high street, just 500 metres long we have a bridal wear shop for beautiful dresses, shoes and accessories, numerous men's outfitters, along with beauty salons, photographers, a travel agent to arrange your honeymoon and plenty of unique shops many of which offer a wedding list service. Not too far away we have a florist (just over the bridge) and a lovely lady who hires out vintage crockery. You could even hold your reception in one of Eton's hotels, restaurants or public houses, or at least pop in for a break to discuss important shopping decisions! If you are marrying locally you and/or your guests could spend the night at the luxurious boathouse19, or why not book the house for a dreamy riverside honeymoon? "I can't recommend Tastes Deli enough. I wanted a cheese cake for my wedding, and Karen took the time to go through all our options. We went to the shop to taste some samples and draw up a sketch of what our cake would look like. She was really knowledgeable and helpful with ideas and suggestions on the taste, look and feel of the cake tiers. She even went out of her way to help me get hold of some mini pumpkin decorations for my table centres, which is going above and beyond the call of duty of a 'cake maker'! Best of all the cheese tasted great, and the little that was left we took home to enjoy after the wedding. If you want a cheese cake, ask Tastes Deli to make it. It will be amazing."